Video of the 9th year of Germantown research, 2017. Premiered on Sept 15, 2018, and then installed in a temporary exhibit at the Germantown Library, into December. From the video, the still photograph on the left, by Court Meyers, depicts the neighboring Robinson house around 1900, and likely includes three residents of the nearby Parsonage, the Persons family. "300 Years of Palatine History at Germantown's Parsonage" is a presentation at the annual meetings of the Council for Northeast Historical Archaeology, Lancaster, PA on October 30, 2010, in the heart of Pennsylvania German country, as the project's scholarly premiere. The 2012 exhibit traces the migration of Palatines from the Rhineland to the Mid-Hudson Valley, the diaspora west and southward where they become known as "Pennsylvania Dutch" and Germans in the Shenandoah Valley. The right side of the panel introduces research in Germantown with a focus on the Parsonage, the spiritual center of the community. 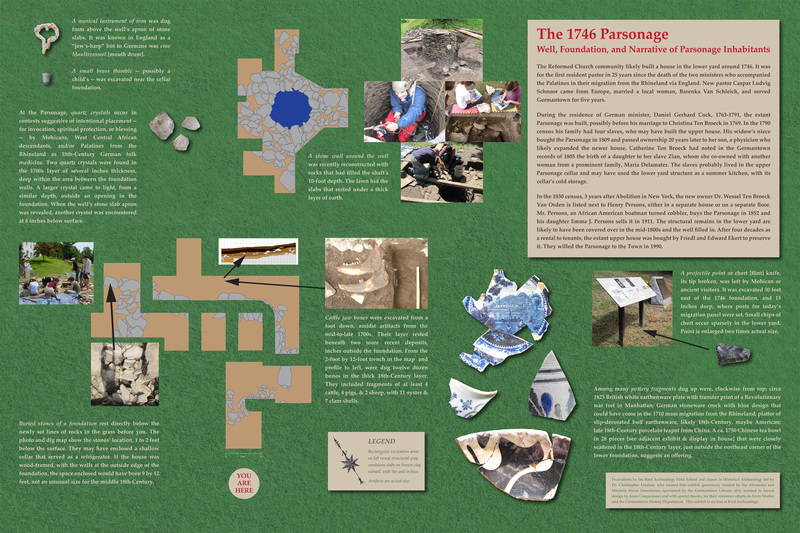 The 2010 exhibit to celebrate Germantown's 300th anniversary of settlement presents a history of the community through a three-panel display case and a slideshow that also depicts initial excavations at the Parsonage. In actual exhibit, slideshow appears in upper right space of display, but online scroll down to view. Cartography of Queensbury and the other three early 18th Century villages, with analysis of the social location and environmental potential in parcels belonging to 8 families for whom we currently have sufficient information to situate their grants. The article on pages 28-30 of the Society for Historical Archaeology newsletter describes recent discoveries in the cellar of the Parsonage, probably a slave quarter, constituting strong evidence that the occupants performed African religious rituals of protection and healing there. Clusters of sacred items beneath the hearthstones and etched figures in the fireplace surround are indicative of BaKongo rituals from West Central Africa. In particular, the quartz crystals were thought to control ancestral spirits, envisioned as shafts of light, as they entered the house from the chimney and ascended the adjacent stairway. The interactive presentation begins with a close-up map of Germantown's two central villages in 1740. Then three historic maps -- 1740, 1798, and 1873 -- overlain on 1980 USGS topographic surveys of the whole town. Soon to come are more detailed versions of these 3 maps. An upcoming exhibit at the Germantown Library will enable use of the computer map to overlay all the maps, usually two or three at a time, and aerial photos, by zooming at will, with variable transparency for comparison. Summer newsletter follow-up article, pages 15-17. The update adds more historical information about the cellar's inhabitants, slave and free African Americans. It provides results of a chemical analysis of the paint over the figures that suggests they were done in the 19th-Century if not earlier. 1941 photo of Parsonage [full picture and detail below] suggests 1 or more structures in the back yard. The button below opens an interactive map of the 2016-17 dig, at base of a steep slope down from the house. Hover over 1 of the test units to see a title about its contents & click on it to open photos with text. In the map's lower left are 4 trenches, actually farther to the south near the road in the photo, that confirmed a buried foundation there; clicking any 1 will open a video of their excavations. To judge from the topography, around a hundred years ago, a wagon path, fairly level but gently rising northeastward, may have skirted the slope base and the current brambly property line. Originally the ground surface was a shallow loam, formed on top of glacial till clay. A midden accumulated around the Parsonage in the late 18th Century, continuing through the 19th. Between the Civil War and the 1950s, a septic system was emplaced, with ceramic drainage pipelines set into the midden. In the mid-20th Century, topsoil for a lawn was laid down several inches thick over much of the yard. Student excavators have uncovered a buried pile of sandstone slabs, possibly a building foundation, that may have functioned as a retaining wall as midden accumulated. Midway along the wagon path, we have found high concentrations of bone and shell, suggestive of food refuse disposal: a clue that a detached summer kitchen was nearby in earlier times. On the other hand, the shells of oyster and clam, marine and riverine, may have been crushed for mortar and daub manufacture. Yet salt-glazed pottery sherds are abundant, indicative of food storage and preparation in the vicinity. Outdoor exhibit [center panel in photo] about excavations of a buried foundation and stone well, with key artifacts unearthed, and an update on history of the German and African-American families that lived at the Parsonage. A version of the exhibit panel, along with artifacts that appear in its photos, is currently on view at the Bard Library by the Reference Desk. Two maultrommel [mouth drums] have come to light at the Parsonage: one on the terrace in the door yard, and the other beside the well. Classical and modern cello student, Nicky Wetherell, researched its 18th-Century popularity as a solo instument in symphonic music by Beethoven's composition teacher, and experiments during the 19th-Century on its use in early music therapy. Nicky then performed his own creation, with violinist Finn Shannihan. Site under construction for rotatable 360-degree photos of cattle, pig, sheep, horse, chicken, duck, and fish bones, plus shells of oyster and clam. This sample of a horse foot bone [middle phalanx or phalange] will rotate and magnify. [Drag cursor horizontally to rotate; click icon to enlarge.] A Bard summer internship project with assistance from a Rhinebeck student. From discovery in the 2010 field school through completion of digging, 10 feet below the original surface, with its final recording and reconstruction. The 1740s well now stands again as a feature of the Parsonage landscape, where for two centuries it lay filled with stone and buried under a midden at the bottom of the western slope down from the 1790s house. Excavation of the stone well at the Parsonage by Prof Lindner, Palatine descendent Alvin Sheffer, and Bard student Sam Osborn, with video by Alex White edited by Caridad Cole, students in the Bard film and electronic media program.